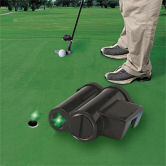 Including blue violet laser pointers, green laser pointers, red laser pointers, rechargeable laser pointers, red & green combo laser pointers, tea infusers, LED keychain lights, miniature hands free phones, golf putter lasers and underwater scuba laser instruments. Get the latest in unique high-tech items all from one site, without having to leave your home! Click images below for more info.